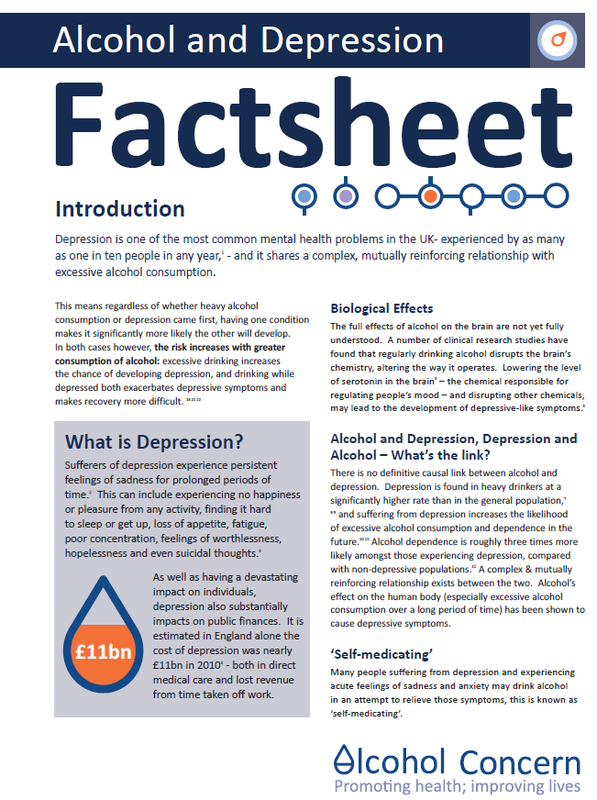 Depression is one of the most common mental health problems in the UK – experienced by as many as one in ten people in any year – and it shares a complex, mutually reinforcing relationship with excessive alcohol consumption, according to a new factsheet from Alcohol Concern. It shows how the relationship works both ways; depression is found in heavy drinkers at a significantly higher rate than in the general population, and those suffering from depression have an increased likelihood of excessive alcohol consumption and dependence in the future. Excessive alcohol consumption over a long period of time has been shown to cause depressive symptoms. A number of clinical research studies have found that regularly drinking alcohol disrupts the brain’s chemical responses, altering the way it operates due to lowering levels of serotonin.